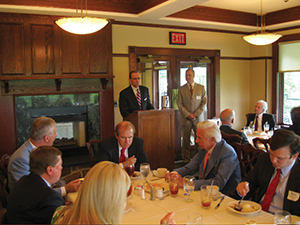 Attorney Neil T. O’Donnell spoke recently at the inaugural Northeast Pennsylvania member luncheon hosted by the Pennsylvania Association for Justice[PAJ]. The event was held on June 19th at the Glenmaura National Golf Club in Moosic, Pennsylvania. PAJ’s mission is to promote a fair and effective justice system. PAJ supports attorneys who work to ensure that any person who is injured by the misconduct or negligence of others can obtain justice in Pennsylvania’s courtrooms. Attorney O’Donnell is the founder and managing partner of O’Donnell Law Offices, a personal injury law firm located in Kingston, Pennsylvania. Visit www.odonnell-law.com for additional information.